All MLS Listings Are On The Same Websites, Why Pay More To Be there? Listed in the Georgia MLS (GAMLS) and FMLSUntil Sold or Rented. Upload up to 32 of your images to GAMLS and FMLS. MLS data feed to over 30,000 websites! The State of Georgia is unique in that it has one MLS service that covers a large part of the state. Now you can save like a for sale by owner, FSBO, and still get your home in Rivermoore Park listed in the MLS’s, full service internet marketing and professional contract negotiation with the Web Home Listing service of Dream Street Properties, LLC. GAMLS covers the extended greater Atlanta area all the way out to Rome, Cedartown, down to Newnan and over to Macon and back to Athens. Back up the I-85 corridor, the Georgia side of Lakes Hartwell and West Point, and most the North Georgia Counties. The coverage includes Statesboro, Bulloch County, Milledgeville, Baldwin County, St. Marys, Camden County and Charlton County. 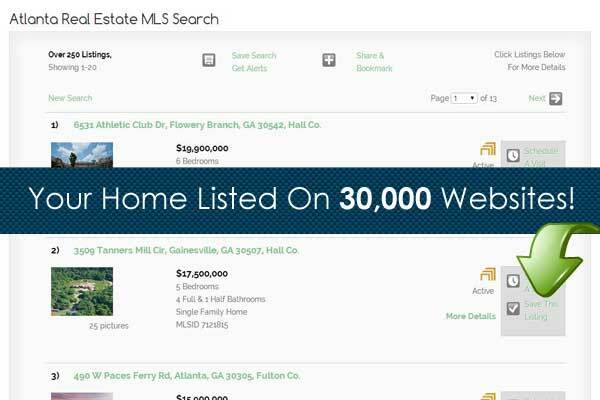 Your listing through us will be on over 30,000 websites including Realtor.com, Zillow, Trulia, ALL of the other real estate companies websites. RE/MAX, Coldwell banker, Keller Williams, Century 21…we all provide the same MLS listing service for Georgia. Most of the above companies charge 6 to 7% and do not do much more than we do for $199! The good ones will give you weekly updates, print flyers, put on signs, lockboxes, show your home to unrepresented buyers and give you a local contact to feel good about. Does paying several thousand dollars too much make you “Feel Good”? If you have the time to do it, you can save thousands on the listing and sale of your property.